The EXP-Series adapts to demanding applications with indicating power at an economical price point. Rugged aluminum die-cast enclosure and new compact size with USB power + 16 million internal counts for accuracy. High intensity LED display. 3 versions to suit most any need. Ideal for permanent or portable applications — designed and manufactured right here in the USA. The parts and components of these Pennsylvania Scale Company products are warranted for ONE YEAR from the date of retail delivery against defects and materials and workmanship, subject to the terms and conditions of our standard Warranty. 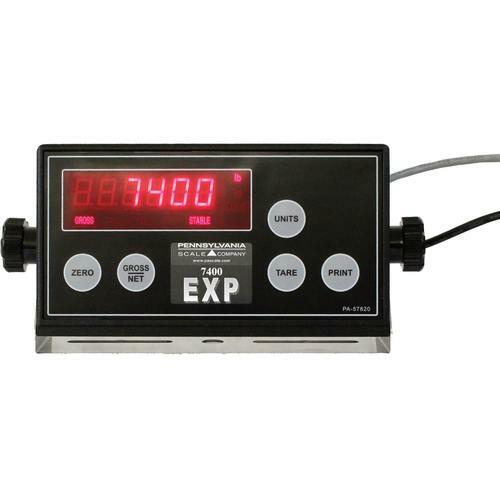 7400 EXP: Weight-only indicator ideal for high capacity applications in lbs/kgs. High intensity RED LED display, 0.56? High intensity red LED display, 0.56"